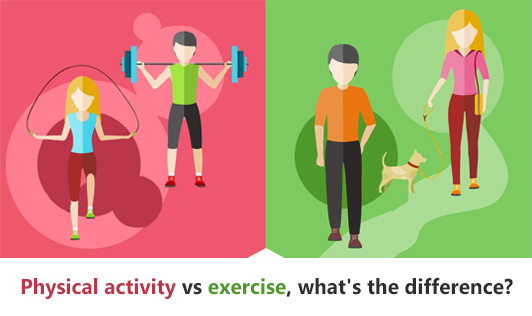 Physical activity vs exercise, what's the difference? You may think that since you work out regularly, you don't need to worry about doing additional active things each day. You hit the gym before work in the morning, so when your spouse brings up the idea of an evening walk with the family after dinner, you think, "I better not overdo it after today's tough workout”. Unfortunately, I think a lot of us fall into the trap of thinking we don't need to be "active" because we already "exercise." But when experts and fitness professionals talk about the benefits of living an "active lifestyle," they're talking about one that includes planned workouts AND additional daily activity that gets you on your feet. If you think about it, you only spend a few hours in the gym each week. Even if you're there 6 days a week, for an hour at a time, there are still over 100 waking hours in your week that you're NOT exercising. And for those of us with desk jobs, at least 40 of those are spent sitting. Several more hours involve driving (sitting), watching TV (sitting), playing on the computer (sitting) and other passive activities like letting the dishwasher wash your dishes for you. Years ago, there was no such thing as obesity or the health problems that come along with it. People were on their feet all day long—simply moving because they had to in order to survive. We didn't drive anywhere or sit at computers all day. We farmed, weeded, built, tended, carried, walked, harvested, hauled, cooked, cleaned—everything. On top of that, we didn't have remote controls (or TVs for that matter), dishwashers, washing machines, or automatic lawnmowers. And we think modern life is hard! Just think of the calorie burn and the muscle-building potential of all that activity each day!